Customization and comfort is key to a productive work day. 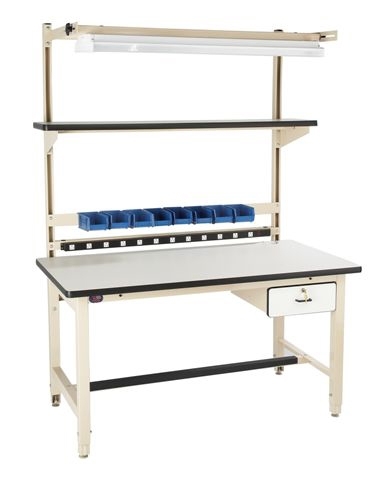 This adjustable plastic laminate workbench, available in either 60"Lx30"x30"-36"H or 72"Lx30"x30"-36"H is exactly that, customizable and comfortable. 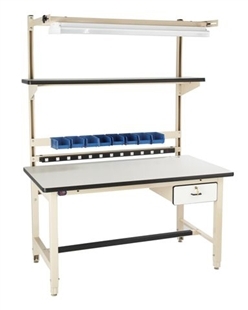 Choose from 60" x 30" or 72" x 30"
Fully configured Workbench with our most common accessories. Takes the questions out of workbench configuration & provides operator with our most common accessories. Custom configurations can be special ordered. Please Call 1.800.637.9508 for more information.